Father Christmas Has Come to Town!!! Source: The Advertiser, 18 Nov 1938, page 1. 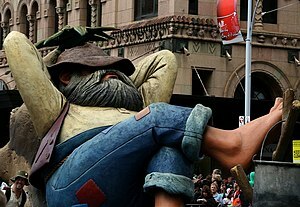 The jolly fat man with the white whiskers, and dressed in red, arrived in Adelaide, South Australia today, much to the delight of young and old. 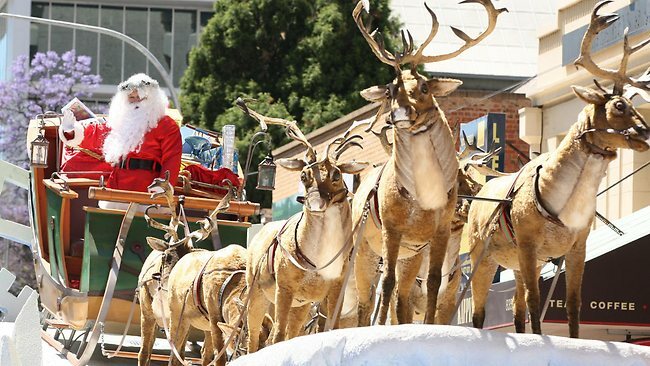 This is the 80th year that “Johnnie’s Pageant” has wound it’s way around 3.35kms of Adelaide city streets with clowns, jugglers, dancing girls, brass band, highland pipes a myriad of “floats”, and so much more, with the joyful task of escorting Father Christmas to “The Magic Cave”. There he will remain, until the night before Christmas, and meet with the children of Adelaide for them to whisper their requests into his ear. For 80years now the children of Adelaide have been enthralled and delighted by the vision of one man, Edward Hayward, who was the owner/ Chairman of the Board of the John Martin’s Department store. With the effects of the Great Depression biting hard, and people’s spirits so low, Edward Hayward convinced the Board to stage a Christmas Pageant to cheer up the people of Adelaide. For some 30 years Father Christmas had set up residence in the “Magic Cave”, inside John Martin’s Department Store, so the Christmas Pageant was established as an extension of this. My mum, Kathleen Mary (Allan) Crout grew up as “a child of the depression” and was 11years old when, on 18 Nov 1933, John Martin’s held the first Christmas Pageant. As a child, I re-member mum telling me that it seemed like magic and what she most wanted to do was to ride “Nipper”, the Chestnut Rocking Horse, which is still the dream of many a young girl. After a lifetime of deprivation, and still many years of hardship to endure, my mum’s little girl’s heart was filled with happiness. The dream kept her going, enlivened her spirit and she never forgot the kindness of Edward Hayward, later to become Sir Edward Hayward. As for me, horses terrified me and what I most wanted was to have a ride on “Nellie” the mechanical elephant 🙂 … To watch a wonderful video of the story of Nellie, who kept breaking down and was finally “put out to pasture”, but then revived and re-invigourated, just click HERE. Although the John Martin’s Department Stores closed down in 1998 the tradition carries on and is now organised by South Australian Credit Unions. For more information on this, just click HERE. 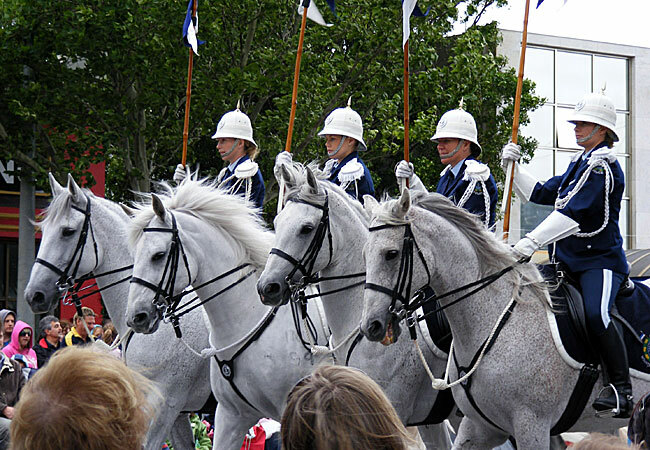 The Adelaide Christmas Pageant always begins with the beautiful “greys” of the South Australian Mounted Police. … and always ends with the person the children most want to see… FATHER CHRISTMAS!!! Father Christmas arrives, 2012. Source: Sunday Mail via Adelaide Now. May Christmas 2012 be a time of much joy and happiness for all. 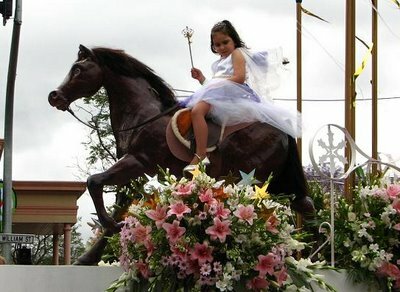 This entry was posted in Christmas, Customs, Festivities and tagged Adelaide Christmas Pageant, Adelaide South Australia, Sir Edward Hayward by Catherine. Bookmark the permalink. Hi there 1st Cousin Six times removed! Thanks for all the updates. And dear cousin Crout, let you be the very first in my family, extended though it may be, to wish you a Merry Christmas!!! It is wonderful to hear that this fun Christmas tradition, and the memories it holds, is continued unlike many that have gone by the wayside. I hope it continues for many more years to come. Oh, indeed Kerryn. Four generations of my family have now enjoyed the Pageant and hopefully it will become treasured, and maintained, as a much loved tradition for all South Australian children. How lovely! Hard to believe it is already that time of the year again. Almost unbelievable, eh Fi? … “Tis the season to be jolly … ” especially if you’ve been an old misery guts until now 😀 … only joshing of course. I really liked the way you included both the old advertisement and the recent photos. It’s awesome how this tradition has lasted for so many years. Lovely photos of your Christmas parade! And those “greys” are such beauties.